After receiving initial U/G Training at Usworth Colliery, Malcolm returned to Boldon Colliery. His early experiences of Coal Mining were on Boldon Colliery's Haulage Roads. This document is a record of his early Mining Memories. The vast majority of information and interest is in the railways we see "or saw" around us, but a huge network of concealed industrial railways have existed until very recently in the mining industry. Just as it was necessary to transport coal from colliery to the docks, cokeworks, gasworks, power stations etc. etc. so it was required to move it from coal-face to the surface. However, unlike the surface transport systems which are usually accessible, or at least in view of those likely to take an interest, underground mining railways can only be familiar to those who are associated with the industry. Few standard gauge inclines now exist. For a number of years I was a volunteer on the Bowes Railway, which, at that time featured the only working example of a rope hauled, standard gauge incline. Visitors in general were surprised at the size of the building and impressed with the machinery. However, to the mining engineer, such machines are/were, everyday pieces of equipment. Although in the mining industry, the winding engines are frequently many times more powerful and massive than rope haulage engines, they are usually at surface level. Underground, and often situated a mile or so "inbye" (away from the shaft bottom), excavated hauler houses accommodated rope haulers equal to, and in some cases, larger than many surface rope haulage installations. As a miner, my initial 4 years were spent almost exclusively as a haulage hand, throughout this time I was studying to be a mining engineer. During this period, I was involved in the operation of a 375 hp. rope haulage system. [more of that later perhaps] I also operated smaller haulers and spent some time on locomotive haulage as the shaft bottom ‘shunter’. Although ponies where in use in other parts of the pit, I did not have occasion to work with them. The recent demise of the coal industry and the closure of collieries has, together with other factors, set me thinking that what seemed common place to me as a pitlad, is in fact quite unusual to the vast majority and, if not recorded, will become forgotten in the very near future. Don't get me wrong, I'm not advocating the return of those 'not so good old days' but as they say, "If you have no past, you don't have a future". So where do I go from here? If possible, I intend to give some atmosphere to my experiences and explain the method of working. Memory is to be my only source of information, so estimations will often be resorted to. After Nationalisation of the coal industry in 1947, a standard training scheme for new entrants was adopted and held sway for many years. Below the age of 18 years, new starters had to complete 10 weeks training, consisting partly of underground experience with the remainder done in the classroom. Entrants above this age were classed as adults and had 3 weeks instruction, the bulk of which was spent underground. In the latter case, it was usual to work a short shift in the pit, have a shower, then return to the classroom for instruction and discussion. Such was the situation when I joined the National Coal Board in 1956, as an 18 year old, I signed on at Boldon Colliery and was sent to Usworth Colliery which was the nearest colliery having training facilities, to undergo my 3 weeks course. With some 60 years having elapsed since the event, only the broad details are still remembered, the following accounts are those which remain etched into my memory. Having found my way to the training office, I was in the company of some ten or so new starters, I was by far the youngest. After a short introduction to our instructors and an apology for the absence of the training manager, we where kitted out with boots, helmet and cap lamp, then without further ado, into the "cage" and down the pit. [Rope haulage used in the vertical plane.] Along the dusty roadway we novices trudged in single file behind our allotted instructor, the first lesson learned was "keep ya' heed doon". This lesson could range from a nasty jarring to the neck which dislodged your helmet, or an almighty thud as your helmet struck some immovable object, sending that newly issued cap-lamp and helmet bouncing in the dust and planting your 'behind' firmly between the tub track. With a thousand "do's and don'ts", a whole dictionary of new words, miles of the Training Gallery roadways together with our bumps and bruises we trekked back to the shaft bottom. So endeth the first lesson, as they say, such was my transformation from a Co-operative grocery assistant to a Pitlad. Those short shifts in the training gallery were not too arduous, the instructors were old hands and in general got their basic message of safety across in a light hearted manner. A good measure of 'leg pulling' and story telling being the order of the day. We were shown how to use the shovel, axe, hammer etc. how to set and withdraw props and chocks. 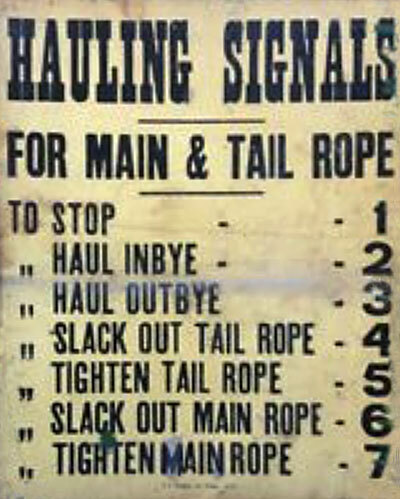 There was also instruction on the various types of rope haulage including practice at signalling, clipping and unclipping sets of tubs from the moving ropes. One shift was spent visiting the actual working part of the pit. Three things that I do remember about the visit, which seemed to involve endless walking were:- being herded into a refuge hole when the Main and Tail rope set went past, dozens of little tubs stirring up the dust as they rattled on their way at breakneck speed. We saw the roadway being driven which connected Usworth to Follonsby, this eventually ended coal drawing at Usworth. Lastly there was a visit to the stables where my allergy to horses showed up with a vengeance, and I left gasping for breath with eyes and nose streaming. It goes without saying, those initial few weeks did not make us into coal-miners, it did however give us some basic 'Pit-sense', an essential ingredient in keeping the innumerable dangers of mining at bay. This again brings us back to underground haulage. The accident rate to persons employed on haulage duties was higher than any other type of work, including face workers. When the electric cap-lamp was introduced into coal mines, this fact was recognized by an order that the first workmen to be issued with them were persons employed on haulage duties. The effects of improved lighting underground is a subject in it's own right, how coal was produce by the light from a flame-safety lamp is beyond my imagination. During the first few years of my own experience, general lighting was confined to the shaft landings, main haulage landing, loco sheds and main pump houses. With the initial training completed, I was instructed to report to the Training Officer at Boldon Colliery. After a few preliminaries, it transpired that a juvenile was also starting on the same day, so we were both escorted to the pit-head baths, our pit clothes tucked under our arms. Boldon was one of the earlier collieries to have the benefit of pit-head baths, I understand it was a German system and rather unusual in Britain. Instead of the more common arrangement with clean-side and dirty-side lockers with showers between, the set up was as follows: the entire area was under one high roofed building. Upon first entering the baths a rather daunting sight was beheld, instead of using lockers, clothing was held on grappling iron hooks which were suspended from beams above by means of a rope and pulley. Each miner was allotted a hook number, the rope ends terminated at shoulder level on a pair of pegs on which the rope was wrapped when the hook was pulled up. My first impression was that of a mass “hanging”, perhaps I have an over active imagination? The individual shower cubicles were located down both sides of the building. With hook numbers issued, it was on with the now familiar dirty clothes and into the time-office to be given a number and clocking-on card. The lamp cabin fixed us up with cap lamps and yet again a number to remember. Neither I nor my fellow new starter were given any clue as to where we were going or what work we would be doing, we merely followed our leader who was by now carrying his gleaming flame safety lamp and his travelling (walking) stick. Over the covered gantry, we were led to the Man-riding shaft. After a short wait, it was into the cage and down past the fan drift where the noise and rush of hot stale air indicates the point at which the ventilation fan removes the foul air from the pit. This particular shaft had a very bouncy ride, at times, it was almost as if the winding rope was a rubber band. As my engineering training would later reveal, there was a reason for this and, as it involves rope haulage there may be an opportunity to delve further into this at some point later. Once out of the cage we were searched for “illegal materials”, matches, smoking materials etc. then led off along the shaft landing. About 100 metres from the shaft we were halted at a door leading off from the side of the roadway, after being warned that this was not an authorised travelling way, there was a notice to this effect on the door, but, because we were in the charge of an official it was O.K. Once through the three sets of doors, we found ourselves in the battery locomotive shed, with the spare batteries on charge, the hum and spooky blue flicker from the Mercury Arc Rectifiers (chargers), the lighting was excellent. With its concrete floor and whitewashed walls and roof, it was quite unexpected to find such a ‘clinical’ place in the bowels of the earth. On leaving the loco shed we entered the main intake air-stream, a bit of a shock after the hot sticky air we had left on the other side of the ventilation doors. Heading into the “wind” we arrived at the bottom of the coal drawing shaft. Winding coal was in progress, the three decked cage plummeted into sight, it stopped with the first deck in-line, then, with a rush of air, all hell seemed to break loose as the first full mine-car was pneumatically rammed into the still bouncing cage, ejecting the empty car out at the other end. With hardly a pause all three decks of the cage were loaded/unloaded in a similar manner, then, just as quickly as it had came, it shot off, up into the darkness. As the empty vehicles left the cage, they ran onto a tilting platform which allowed them to gravitate into the empties road. The whole operation, with one exception, was automated, and that was where my companion came into the picture. These new fangled mine cars were fitted with automatic couplings which were held in the release position during the winding operation and this was achieved by lifting an end mounted horizontal lever. It required the services of a shaft lad wielding a brake stick to return the lever to its coupling position by dealing it a well directed blow as the vehicle sped past. The training officer and I stayed back whilst an experienced hand showed the young‘un how to go on, then, when he hit more times than he missed, off we went, INBYE. At a steady pace, we retraced our route but this time headed straight past the loco-shed, and after a few hundred yards reached a loco control point. An exchange of conversations between the training officer and the control man, together with much winding and shouting on the magneto telephone, indicated that we were awaiting the next ingoing empty set. This duly arrived and we climbed aboard the first mine car, I was shown that my safety helmet could be used as a seat. It was rather like balancing on an unstable “potty” but kept the vital parts clear of the damp coal dust and with sufficient practise, became quite comfortable. Off we rumbled, the only illumination coming from the glow of the loco’s rear light, the speed seemed tremendous due to the confines of the roadway although I cannot recollect any fear or alarm at the new experience. In due cause, the set drew to a stop, it was on with our helmets and over the side onto the dusty roadway. I was led off again towards some dim lights and once more informed that in future would have to use the proper travelling way via. the return rather than the intake which was the engine plane, Main and Tail haulage road. Soon we left the lights of the landing behind and past a section of Zig Zag track, these were called Jazz Rails by the haulage hands - their purpose will be discussed later - and the roadway gradient increased sharply. It was noticeable that although my elderly ‘marra’ was somewhat short of breath, he was alert, and soon I was ushered into a refuge hole. “The set’s on its way”, was his short comment. Because of the method of working, the outbye or Main rope had already been detached, consequently, along this stretch of roadway, the only indication of the sets rapid approach was the rumble which I was now very aware of. Within seconds, the 26 full mine cars had been and gone, leaving the Tail rope clattering on the midway rollers in its wake. After a short break for my leader to regain his “wind” it was head down and trudge on. 1. Bankhead, where the lonely operator detached the Main rope. 2. Hauler House, which radiated hot oily air and brake dust. We did not go inside, just passed by around the curve with its inset rollers. 3. Off-takes - points at which two districts shared the hauler. 4. No.1 Main and Tail landing. Here the track doubled forming the fulls and empties roads. At the upper end of the landing we arrived at our destination; Bensham Seam No.1 loading point. It was here, amid the scraping and clanking of the chain conveyer, the clatter of falling coal, sudden gushes of exhausted compressed air, hum of electric motors, clanging of bells and clash and rumble of mine cars, I commenced my duties as the mat-lad. After introducing me to a workman who was to be my ‘close personal supervisor’ the safety officer took a short rest, then set off “outbye”. The loading point was the place where coal was transferred from the conveyor system to the mine-car rail transport, the mine-cars passing under a chain conveyor from which the coal descended via, a short chute. In order to keep the conveyor system running whilst the gaps between the cars passed under the chute, a strip of conveyor belting (the mat) had to be placed over the gap to prevent spillage, hence the job of the mat-lad. At this juncture, reference to the site sketch plan will give you a much better idea of the layout than I could put across in the way of description. Mat Lad: A job hierarchy existed, starting with this, the lowest rank. A support wall for the loader conveyor required the use of three “mats” as once the mine cars passed behind the wall, there was no room for access. It was the mat-lads duty to clean up any spillage and replace any mats which for various reasons, fell into the cars and were immediately buried. Stanley knives were not around in those days so a well honed pocket knife was a necessity when a new mat had to be cut from the nearest roll of worn out conveyor belting. Dodging the tugger (landing hauler) rope and mine cars on the empties side was a life preserving pastime. For a young lad, the job was not arduous, coal output was spasmodic so between times there was plenty banter and horse-play. However, the routine was boring to the Nth degree. Token Lad: This was the first step on the promotion ladder. Whilst attaching the tokens to the minecars, (this identified the district the coal came from for payment purposes), was his stated duty, the main job of the token lad was to keep the loading point supplied with empties and run the full and empty sets between the loading point and the Main & Tail haulage landing. This was achieved by signalling to the Direct Hauler (tugger) operator, coupling and uncoupling minecars, changing the points and attaching and detaching the anchor chains which secured the sets on the steep gradient. More to the point, the token lad rode up and down the landing on the sets, unless one of the more fastidious officials was around. This rather dangerous practise eliminated a great deal of trudging back and forth, however, it involved jumping on and off moving vehicles, just too easy for agile young lads. On a similar note, the bell signals were rarely used as the hauler driver could see the token lad most of the time so an unofficial cap-lamp waving sequence was used. Between times, the ‘token lad’ could wander around in the landing or nod off in a long quiet spell. Of course, these latter activities where strictly unofficial. Landing Lad: Many months of experience had elapsed before this status was achieved. To a considerable extent, as long as sets were run as soon as they were available, the landing lad was left to his own devices. An excavation at the outbye end of No.1 Landing housed the equipment required for the operation of his duties. There were two sets of bell signals, a magneto telephone, controls for the full side retarders, a steel hook ‘called a cruk (crook)’ for moving the ropes, shovel, hammer and last but not least, an array of timber formed into a seat. Statutory notices and signalling code boards were located in appropriate places. A whole new signalling language had to be memorised to do the job effectively. The bell signals were far more efficient than the telephone as this was a ‘communal’ system where a number of phones were on a common line and when it rang it was usually for someone else. Why two sets of bell signals? One ‘rapper’ as the signals were called, communicated with the loading point (inbye) which sent the ‘full’ sets down to the landing whilst the second rapper communicated with the Main & Tail hauler (outbye). Perhaps at this point, a more detailed description of the landing lads refuge or ‘hole’, which was the term applied to this type of excavation, should be given. Floor area was approximately 6ft x 6ft and height originally in excess of 6ft had reduced to something like 5ft 6in due to pressure. A curved brick curb reinforced with the top section of an arch girder and about 18in high had to be stepped over to enter the hole. The purpose of the curb was to protect the occupant from the ever-present danger of run–away sets. Running a set was a one man operation, apart from the hauler driver, who was situated at least half a mile away, nobody else was involved at this point. No.1 landing was ready to run a set when 26 full minecars had been lowered down from the loader and 26 empty cars had been hauled away by the landing ‘tugger’. Landing a set from the loader was mainly done by the token lad as the tugger was used for this purpose. Prior to the set leaving the loader, the operator signalled to the landing that it was on its way, the only action required of the landing lad was to operate the pneumatic retarding devices which held the full set on the gradient until the hauler tail rope was attached. Incoming sets were not available on demand however, the hauler also served another landing (No.4) and there were numerous other factors which limited the supply of empties. When a set was to be run, a regular sequence of events had to be carried through. Before sending the signals to the hauler, it was necessary to raise the ‘bull girder’ safety device situated just outbye of the landing points, it was even more important to ensure the points were set for the empties road. The set was then ‘rapped in’, the landing lad then made quick time, to the top end of the landing. Usually by this time, the set would be entering the bottom of the landing and the front end of the set would appear illuminated by the dim, sparsely spaced roof lighting. When the faint image gave a lurch to the right, there was the reassurance that the set was indeed entering the empty side, otherwise it was a ‘smash-up’. Although the set entered the landing at speed, the hauler driver knew by his indicator, and more precisely by marks on the rope drums, as to where the set was. In order to transfer the ropes from empty set to full set, slack rope was required, and this was done by stopping the incoming set about 2yds short of the last minecar of the full set. Usually, by the time the set had reached this approximate position, the hauler driver had reduced speed down to walking pace. A single long pull on the rope of the roof mounted rapper and the set clattered to a stop. It was then necessary to attach an anchor chain to one of the empty sets dummy axles. This was done by lying in the dust and attaching the chain which lay between the rails by means of a large shackle. A ‘slacken tail rope’ signal was then sent to the hauler and the set settled back, coming to a jolting halt as the chain took the strain of 26 minecars on a 1 in 30 gradient. This action also often released the ‘spin’ in the haulage rope and the entire coupling and attaching chains would make a few violent revolutions. It was advisable to keep well clear. The safety chain was removed and thrown over to the full side, then the Wilson coupling adaptor was detached by a well directed blow from the platelayers hammer which stood in the dust between the tracks solely for this purpose. When released, the rope would spring at least 3ft inbye. The coupling, termed the ‘chain-end was then thrown over to the full side and the necessary attachments made. Although an anchor chain had been attached to the full set by the token lad this was invariably slack as it was only in place as a safety measure, the pneumatic retarders being capable of holding the set in normal circumstances. It was therefore only necessary to lie in the dust and remove the shackle. The landing lad then made his way to the outbye end of the set. At this point, because the set had been stopped short to allow slack to couple the tail-rope, it meant the main-rope was an equal distance short of the front of the full set. Fortunately, gravity was available to solve this dilemma. There was no safety chain on the main rope chain-end, the ruling gradients placed virtually all the load on the tail rope. Also, the uncoupling lever was at the outbye end of the minecars, so it was merely a case of releasing the chain end coupling by lifting the lever. This done, the chain-end was thrown between the full and empty tracks. A large wooden safety chock, the aptly named ‘cheese chock’ having stood guard between the rails of the full side was dragged to one side. By releasing the retarders, the full set began to run down the gradient until it was brought to a halt by the tailrope. The hauler operator had his brake only gentle applied and the set would travel far enough to allow the rope to be coupled to the set. With the ropes attached, a last minute glance at the ‘bull’ to make sure it was in the fully ‘up’ position and it was time to ‘rap’ the set away. It was essential to have the ‘cruk’ on hand, the next couple of minutes were hectic and nerve racking ones. The ‘tighten main rope’ signal was sent to the hauler, the slack rope dragged over the rails and dust and tightened with a jerk, the tailrope on the rollers over the far side of the rollers went bar tight then started to move as the 375 hp dragged the partially braked drum into motion. Within a few seconds the set was steadily accelerating and the signal ‘haul outbye’ was sent. Immediately this was done the landing lad took to his heals with his ‘cruk’ to a point some midway up the landing. As the set travelled down the landing, the tailrope fouled on the retarders which prevented it swinging over onto the midway rollers, whilst this was damaging to the rope, there was a much greater danger. Because the tailrope served two districts, there was a pair of sockets joining the rope which allowed it to be used in such a manner, whilst it was designed to pass over the rollers and return wheels, there was a serious danger should it snag on any other equipment. Hence the frenzied activity. The method of releasing the rope from the retarders was to straddle the rope, which was now moving at high speed, hook under it with the steel ‘cruk’ and lift it out from retarders. A really good heave at the correct instant could occasionally lift it out of all the obstructions in one go but, in most cases, it would only partially lift out and a sprint to the next point were it was snagged had to be made and the lift repeated. Once out of the retarders it was a relatively easy matter to lift it onto the midway rollers. Although I never had to resort to it, if the rope had not been released in good time and the sockets could be heard bouncing over the rollers towards the landing, (they make a really load crack as steel struck steel) the drill was to ‘rap’ the stop signal to the hauler. As to whether the machinery would have stopped in time, is another matter, I never had to put it to the test. With the set safely on its way and the sockets making their jarring clatter more noticeable by the second as they scuttled over the rollers, they then made a 180 deg turn around the return wheel then bounce out bye. A sweating landing lad then returned to the foot of the landing, dragged the cheese chock into position, change the ever-so important points and swing on the ‘bull’ to bring it down to the safety position. Time for a drink of water from the tin bottle, perhaps a jam sandwich and a relaxing read before the next set is ready. No.1 landing was by far the busiest of the two districts, No, 4 landing served only one hand hewing face whereas there was a hand hewing and a power loading (shearer) face working into No.1 landing. Some shifts were really busy, when the faces were producing well, and sets were rapped in as soon as they were available. On odd occasions, very little moved as all manner of breakdowns could occur within the system. Regarding hauler operations, many questions as to what was happening could be ‘read’ from the action of the rope. After the set departed the landing, it went directly outbye as far as a point called the ‘hitch’. This was the top of a very steep section of the system which terminated at No.9 landing where the locomotives took over. The set was stopped at this bankhead and the main-rope was detached. Due to the distance from the inbye landing, even when stopped at this point, the tailrope was tight. There was no mistaking when the set was descending into No.9 landing, the gradient at the foot levelled out considerably and with about one and a half miles of rope trailing behind it, the set was allowed to gather tremendous speed down the inclined section. On many occasions the set did not clear the landing points and although arrangements could be made to haul them in by loco, it was quicker to haul the set back up the gradient and try again. It was common to see sparks flying off the rope as it skidded over rollers during these rapid descents. When the rope was detached at No.9. it sagged between the rollers but, due to the distance involved, retained some of its tension. On the inbye journey, speeds were steady all the way but again the set had to stop at the top of the ‘hitch’ to have the main rope connected. If the incoming set was required again in the same landing, then it could well carry on straight to that location, however, very often it stopped at the ‘offtakes’ which was situated just outbye of the No.1 & No.4 junction. If the rope remained tight, then the set was awaiting a destination. On the other hand, when the rope dropped slack, then fell totally limp over the rollers, it was a sure indication that the ropes had been disconnected and No.4 landing had possession of the set. Enough time to wander up to the loading point for a bit of company. A Single-Track Haulage System operated by a Haulage Engine with Two Drums, each with a separate rope. The engine is usually located at the out end of the system. The Main Rope is attached to the out end of a Set of Tubs, and the Tail Rope passes around a sheave (a wheel with a groove for the rope to run in), and is then attached to the rear end of the Set. To draw the Full Set out, the Main Rope is wound in, the Tail Rope being allowed to run free. To draw the Empty Set in, the Tail Rope is wound in, the Main Rope being allowed to run free. 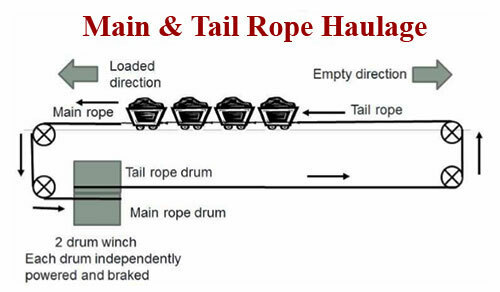 The Tail Rope is equal to twice the length of the haulage road. Main & Tail Haulages are used when the gradient is irregular and the Empty Set will not run in by gravity. This system does not require external power but is only possible when the gradient is in favour of the load to an extent where it overcomes the weight of the up-going empty set and other losses such as friction and even wind resistance. Malcolm says, "Over its length, it employed sections of Loco, Self-Acting Inclines and Powered Inclines. The section from the point shown in the photo down to the Tyne was partly 'self acting', the weight of coal going down, hauling the empties up. 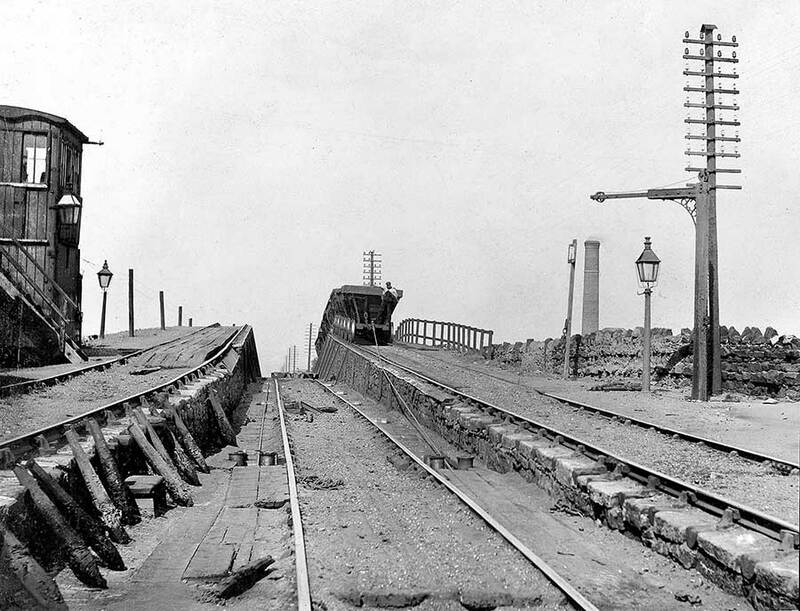 By the time the railway reached Heworth, the gradient had eased to a point where the fulls gravitated to the staithes sidings dragging the rope but the empties had to be hauled back up - this section was Direct Haulage. The cabin in the picture simply contains the signalling and brake operating device. The return wheel with its brake is more or less under the photographer. Springwell incline, over a mile, was also self acting. Colin E. Mountford's book, Rope & Chain Haulage, won him an award - presented by Stephenson Locomotive Society at the Institute, Newcastle. Rope haulage is a very varied subject. Mail & Tail was the exception rather than the rule for surface railways. 'The longest rope haulage system in the Kingdom' was the Durham to Sunderland Railway, via Hetton. Locos were introduced about 1850 when it was taken over by the N.E.R." 'Tugger' Man: Before describing the duties of this particular post, I am compelled to point out the severe duty placed on the equipment rather than the operator. The hauler was in fact a general purpose electric winch, a Size 3 Pikrose rated at 32 bhp. Power was transmitted to the drum through a friction clutch and two speed gearbox with a neutral position. During the three years or so I saw this machine operate, there were occasional break-downs and at one point a replacement had to be obtained, notwithstanding this, the duty it performed was far in excess of its intended purpose. As described earlier on, the tugger was operated as a direct hauler. Materials coming into the district could rarely be unloaded immediately, so they were coupled to the rope-end, at least three cars were required to lower the rope down to the landing when picking up empties. It was not unusual to have ten or twelve cars/trams of materials being run as ballast. When coupled to the empty set this involved 38 vehicles, some heavily loaded. It was normal to handle these in top gear which equated to a good jogging pace. Lowering full sets down to the landing was even more arduous for the tugger. The handbrake was never intended to cope with the loads involved so a pipe was permanently attached to the lever to almost double its length. During the lowering operation, it was not unusual to overrun the mark and this required all the vehicles on the full side being hauled against the gradient. Bottom gear had to be engaged for this duty, it was really a slow walking pace job but it never failed. The load was huge, a full set of 26 cars, possibly another 12 that had been filled, a few empties, then all the ballast/materials vehicles which were in use at the time. The engine house, in practice called the tugger hole, a far better description, was indeed just that, an excavation at the side of the roadway. Planks of wood formed the operators seat, he sat at the rear of the tugger which faced inbye but at an angle so the rope ran off the drum, then was guided parallel with the side of the roadway by a vertical roller. The rope then ran over a few rollers and a great deal of dust to an under floor return wheel. The electrical switch gear was situated in a corner at the rear of the ‘hole’. As the operator was in charge of electrical apparatus, it required him to be issued with a flame-safety lamp, to be used for gas testing purposes. Instructions on the signalling board, which was nailed to a wood support prop, were simple enough. 1 Stop, 2 Lower, 3 Haul. As previously mentioned, the operator could lean out from his position a see the token lad, so the usual practice was to watch for his cap-lamp signals. Side to Side - Stop; Round & Round - Lower; Up & Down - Haul. Lowering the ‘heavies’ to pick up the empty set was done in neutral, the token lad would keep an eye out as the cars were being loaded and once the last ‘empty’ was clear of the inbye landing points, he would uncouple at this point and give a nod of his head to the tugger operator. The ‘heavies’ were then hauled clear of the points which were then changed for the run down to the empty set. Another wave when he was ready and the vehicles were away down the landing as fast as they could pull the rope off the drum. As they past the token lad and whilst in the initial stages of acceleration, he casually places a foot on the step, grasps the side of the first heavy and was off down the landing. The tugger operator slowed down as he neared the mark and applied the brake fully when the now dismounted rider gave the side to side (stop) wave. Because of the severity of the gradient beyond the loading point and limited space, the set was too long to be shunted directly onto the full side so had to be split. This was done directly opposite the tugger hole so the operator simply worked from the nods of the token lads head. The set was stopped when about mid point and an anchor chain attached, the vehicle above this point was uncoupled and the half set hauled up and dropped onto the full side. Needless to say, the token lad jumped on the last car as it pulled away, the tugger operator knowing the set had cleared the points when he jumped off. Loader Lad: As far as the ‘landing team’ was concerned, the loader operator was the boss. By this time however, it was a traditional rather than a factual position. The situation arose because loader lads had been on piecework prior to the day-wage system being established and, in the past, they had been in charge of loading operations and indeed some of the older hands were still on their old agreed average wage which was fixed until such time as the day-rate caught up. The loader operator and his equipment occupied a ‘hole’ on the opposite side to the tugger operator but a few yards further outbye. It was far from a comfortable location. Equipment consisted of two control switches, one for the loading conveyor and the other for No.6 face conveyor with was situated some 30 yards inbye, a telephone, a rapper to communicate with the landing lad and about 4 handles to control a series of retarders. Two large air receivers took up a considerable amount of space and the floor was a ‘plumbers nightmare’ of steel pipes. Air leak noise was a constant companion. When the compressed air system failed occasionally and consequently all loading operations had to stop, the silence was almost frightening. In truth, the loader lad was not in strict control of the loading operation at all. The intentions were that the minecars would be controlled on the gradient by the pneumatic retarders but the system did not work in practise. It proved impossible to position the vehicles, movement was too slow when the coal delivery was high and once inertia was overcome the vehicles overran. If speed built up to any degree, the cars would ride up onto the retarders, this resulted in a runaway and smash-ups had been common place. However, miners are a resourceful breed and had worked out their own solution. The solution involved using the tugger to control the minecars during the loading operation. Although far from perfect, the method adopted prevented major problems and subsequent long delays, at the expense of very short but rather frequent stops. The improvised method worked in the following manner. When the car being loaded required to be moved, the loader lad opened the quick release valves on the loading retarders. The load hiss of the exhaust air signalled to the tugger operator (who also had a view of the vehicle being loaded) that movement was required. A short easing of the tugger brake followed by a hard application had the effect of allowing the set to move a short distance at which point, the loader lad applied the retarders. This was all very well until the tugger was needed to haul empties, when this was required, the retarders held the standing set, but once the minecar under the chute was filled, the conveyor line had to be stopped until the tugger was back in control. Almost invariably, any attempt to load using the ‘proper’ equipment, at best resulted in a heap of spillage, or, three or four cars running through empty and, at worst, derailments or a major pile-up. It was frustrating for all concerned, as soon as the conveyors were stopped, the coal-face officials were ringing the telephone and demanding, “get the belt away”. During my time as loader lad, a real improvement was made when the chain conveyor was replaced with a conveyor belt at the loading point. The ‘pans’ along which the chain dragged the coals had worn through and the amount of spillage and coal dust being made by the passage of the minecars was a deplorable danger to quote just one problem. Another great improvement with regard to safety was the removal of a brick wall in the middle of the roadway which was needed to support the drive end of the chain conveyor, the belt conveyor being light enough to be suspended by struts to the roof girders. Most noticeable of all the improvements was the reduction in noise level, not only was the belt much quieter than the chains, but the drivehead itself was further inbye, beyond the landing points. In general, the jobs outbye were done by older men so, as a ‘young-un’, I never worked at these locations but for the purpose of this record I will describe them. As previously mentioned, this was at the junction where the Main & Tail system split into two districts, namely No.1 & No.4 Landings. In effect, each district had its own length of tail rope which, when the set was positioned at the offtakes, stretched into the district, around the return wheel and back to the offtakes. The duties of the two men employed at this point, was to communicate with both landings and direct the set to where it was most needed. When the ropes had to be changed, this was their duty. All that was required, was to attach an anchor chain, detach one tail rope and attach the other. Obtaining the ‘slack’ to attach the chain-end was done in much the same way as was done in the landing, by stopping the set short. However, to couple the ‘sockets’ a Size 1 Pikrose hauler was used to gain any slack required. With a set of empties standing at the offtakes, it was a draughty dusty location as the ventilation current for both districts forced itself inbye. A transformer house, a few yards outbye of the offtakes hole provided a warm refuge. When walking outbye towards the hauler, the haulage road turned off right, but directly ahead, the twin drums were silhouetted by the lights within the hauler house. Even when the machinery was not operating, the smell of hot oil and brake linings was most distinctive. When the drums were in motion, they were only visible through a dusty cloud and when running at full speed down the ‘hitch’, sparks could often be seen leaping from the brake track of the tail rope drum. Visits into the hauler house were very rare as it was strictly a ‘No Admittance’ area, but occasionally it was possible to have a reason to go in. It was really warm, the hauler driver wearing only vest and shorts when sets where running regularly. It was also very Spartan, unlike some of the older haulers at collieries which were more like surface winding houses. Only a minimum area was brick lined and although well oiled, there was little opportunity to 'spit and polish' the machinery. The bankhead (top of the hitch) was about 500 yards outbye of the hauler and again, an older man was employed here. Although a very lonely job, it was only a matter of signalling to the hauler man and attaching/detaching the main rope as from this point, the system was operated as a direct hauler, only the tailrope drum being used. A set arriving from inbye had only the tailrope attached, so again, only one end of the set had to be attended to, as previously described, it did involve removing the coupling adapter and the safety chain. Being at the foot of the ‘hitch’, was a particularly dangerous location. Because the general gradient for much of the main & tail run was in favour of any runaway vehicles, there was a high possibility they would reach the steeply graded section immediately inbye of the landing. This had occurred previously, when a number of loaded vehicles had travelled down the gradient and collided with a full set which was coupled to a locomotive. The ‘jazz-rails’ were an attempt to provide an element of safety. A short series of curves was introduced in the track work below the steeply graded section (a gradient of 1 in 7 from memory) but before the track divided into full and empty sides at the landing points. Whilst sets running at sufficient speed to gravitate into the landing wriggled their way through the bends, a runaway set would be derailed, the subsequent ‘pile-up’ being preferable to more serious consequences. During my period of employment, the situation did occur and although it did not work out quite as planned, there were no injuries. However, ‘Old Mac’ the landing lad was subject to a terrifying ordeal as, although the leading vehicles where derailed at the ‘jazz rails’, the rear vehicles push them into the landing. In doing so, the entire safety curb at the front of the landing ‘hole’ was stripped away. Mac had retreated safely to the back of the excavation and although unharmed was trapped until wreckage was removed. A very nasty experience. The need for coal during the latter 1950s ensured plenty overtime was available especially as for some of that period, Saturday morning was a production shift. This resulted in the rest of the weekend being manned to advance services which could not be done during ‘coalwork’. Typical jobs were extending conveyors and trackwork for the coalfaces. A length of a normal shift was 7hrs 15mins, shaft bottom to shaft bottom. Travelling time from the shaft bottom to No.1 landing took about 50 mins if the manriding set was available, and about 1 hr 10 mins if for some reason it was not available. Shift times were such that the ingoing shift started more or less as the outgoing shift finished, except for the Backshift when there was a gap before the Nightshift started and an overlap between Nightshift and Foreshift. I never did find out why the Nightshift was so unevenly spaced compared to the others. If delays during the day could be made-up, there were often extra hours available on the Backshift to keep output going. When the overtime period exceeded two hours, a free meal was supplied in the canteen at the end of the shift. – Incentive indeed. By 1960, the Bensham seam was worked out and the South Hutton district which was much nearer to the shaft had started production. As a result, fewer men were required so this surplus manpower was redirected to the Washington, Wearmouth & Westoe collieries. My name came ‘out of the hat’ as one of the men to be transferred so I chose to go to Westoe Colliery. As production in the Bensham seam ceased a couple of weeks before the ‘transfer’ took place, I was assigned to the shaft landing as shunter. This simply involved coupling and uncoupling the locomotive sets as they arrived and departed the shaft. The work was undemanding and the shifts seemed very long as there was no walking time to and from the job. A blind eye was turned to riding on the rear loco coupling when travelling between full and empty sidings. and his Experiences as a young Haulage Lad, underground at Boldon Colliery.